Hello. 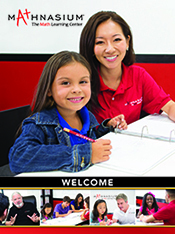 I'm Linh Lu, Owner of Mathnasium of Brampton South, your neighbourhood math-only learning centre. We help kids in grades 1-12 understand math by teaching the way that makes sense to them. Opened in October 2017, Mathnasium of Brampton South is conveniently located in Brampton on Financial Drive and Steeles Avenue West. Our instructors are heavily vetted on their Math skills and personality, during the interview process before they are accepted. Reach out to us now to learn how Mathnasium of Brampton South can help develop your child's potentials in Math! What types of students attend Mathnasium of Brampton South? A gymnasium develops the body. Mathnasium develops the mind. Mathnasium is a learning centre where students Grades 1-12 go to boost their confidence and math skills. Let us help nurture your child's natural love for STEM (science, technology, engineering and mathematics). Gifted children are welcomed here for more challenging enrichment - Mathnasium is a place for them to go to stimulate their inquisitive brains and satisfy their passion for learning. Children that are behind in math come here to catch up, keep up, get ahead and stay ahead! Our assessment can catch the underlying issues and then individualized learning plans are created to improve their math skills and confidence. With the kind of Math being offered in public school these days, we were always worried about our child’ Math learning. Mathnasium of Brampton South really took that concern away as the centre helps not only improve Math skills but also, children confidence and long term love of learning. Our child has improved significantly in Math skills and confidence. Exactly what we need for our child. The centre is beautiful with fun learning environment. The instructors here are very supportive and knowledgeable. I highly recommend this program! Miss Linh is very supportive with students. My daughter was struggling with Maths and never interested to join any program but here with Miss Linh and her team she is enjoying learning maths. I have seen great improvement in her and math solving capabilities. I would definitely recommend this to all parents. I think the owner and the staff are amazing !!! Owner is always so helpful to my children and knows what to do for my sons special needs. My sons have thoroughly enjoyed coming to Mathnasium Brampton South, and as a parent, I see highly impactful improvements and results on their school math tests. Linh and her team ensure that my sons understand the concepts before moving on,so their foundation continues to build properly. Rida is also a very friendly and helpful team member. Highly recommended! We are very grateful for Mathnasium program, especially this location with very knowledgeable, fun and patient staff. My child improves on his Math skills and more importantly, his love of learning Math. This is definitely a long term plan and investment for our child’s future. My daughter is getting so much from the program. Her attitude towards math has greatly improved, and her test scores in school are on the rise. We are so pleased with the program and wonderful staff at the centre. The staff are caring and encourage my son to do his best. We are grateful for the time they spend. The more he succeeds, the more confident he becomes and it shows in his work at school. Mathnasium is so much fun because I don't get bored and the work there isn't too hard. My daughter enjoys her time at mathnasium and looks forward to learning new material every week. It is amazing how she actually understand and loves math. The teachers are amazing at explaining the material so she can understand it. I highly recommend Brampton south mathnasium. Excellent Facility. My son enjoys math, and has excelled very well in a short time. Learning plans are focused, instructors are good, and Linh (owner) is hands on and amazing! Highly recommended. Great experience! I am very happy with Mathnasium. My child has shown significant improvement in his Math skills and confidence. Highly recommending this program. My daughters love going to Mathnasium and have improved so much on their Math skills. The centre is very nice, bright and the instructors are knowledgeable, professional. Best learning centre! I’m so pleased with our decision to have our daughter go to Mathnasium. I’ve already seen a shift in her attitude towards math. It’s been a really positive experience for her. My son has been going there for a month and I already see a huge difference, all the instructors are great, place is very clean and organized, has ambience music which makes the place very relaxing for the students, I always get greeted by the receptionist with a smile, the owner is very nice and cares about the students, money well worth it . Highly recommended. Great job! My daughters have started to regain their love for math and learning. Keep up the good work! We have seen wonderful results in our child's comprehension and confidence in a short period of time. Her performance at school has been enhanced and she has grown to enjoy and embrace math. She actually looks forward to and enjoys her sessions at Mathnasium and is keen on testing and improving her abilities. Mathnasium also adds some fun with competitions and fun events. It has truly been worth the investment and we are so grateful that we ended up choosing Mathnasium for our child! You are very organize and know what each children need. I am very happy with Mathnasium. My daughter enjoys attending and has become much more confident with math. The tutors are fun and friendly and she is excited to attend each day. Keep it up! It’s a great learning place to be. My daughter loves going to Mathnasium. The tutors are very nice and she looks forward to math fundays and different themes throughout the month. My daughter has a natural love for math and Mathnasium has helped her develop skills that they don't teach in her grade level. She has a better understanding of tricks and loopholes that make math easy and fun. The class times are very flexible at Mathnasium which has made it easy to fit her classes in to a very busy schedule. My daughter enjoys going there. The activities really challenge the kids and make learning very enjoyable. The staff is very qualified, patient and understanding. Overall very amazing! The facilities are bright. Lin provides a calm and great learning earnivonment. It is a great experience with Mathnasium. My son math learning skills improve a lot and now he shows more interest in math. Thank you everything that you have done. Mathnasium's approach of having their centres set up with both lessons and game activities is really different than other learning centres as kids can do both and still be learning math concepts. The staff at this centre particularly Linh makes everyone feel at home and welcomed. Wonderful experience! My child has improved so much in his Math skills and interest! Our kids enjoy going to Mathnasium and don’t consider it homework. This speaks to Mathnasium’s ability to make learning fun:). We are very happy with the program and staff. My daughter loves Mathnasium. She actually looks forward to going to Mathnasium after she comes home from school. My daughter misses going to Mathnasium when they are closed for the weekend. If it was up to my daughter. She would go to Mathnasium everyday. They do great job with kids. My Son learn alot in maths and he covers up his grade 1 curriculum in just 1.5 months which is really great. I really appreciate how Mathnasium has helped our kids and I am seeing a great difference in my kids’ studies. Keep it up! Why Kids Struggle with Geometry?